A MONSTER CALLS is the best film I have watched this year - a visually stunning, genuinely moving, imaginative and yet profoundly real film about a young boy who retreats into a world of fantasy to cope with his mother's terminal cancer. The film is directed by JA Bayona (THE ORPHANAGE) using a screenplay by Patrick Ness, based on his own book, all credit is due to the imagination of both. The create a world in which a boy called Conor O'Malley (Lewis McDougall) lives with his young mother (Felicity Jones - ROGUE ONE) in a house overlooking a spooky looking old church with a giant yew tree in the graveyard. The boy is plagued by nightmares in which he loses his mother to a chasm that opens up in the graveyard. One night, at 12:07 he is visited by a monster - the yew tree turned into a kindly/scary old man - and he promises that he will tell Conor three stories, after which Conor must tell him his story - his truth. Conor is sceptical about the relevance or power of fairtytales - especially ones as tricksy and dark and conflicted as those told by the monster. But we soon realise that that monster is there to help Conor understand that in real life there aren't good guys and bad guys and happily ever after. That belief and love are important but sometimes they aren't enough. And that sometimes just honestly expressing how you feel is the hardest battle of all. As the first fairytale unfolds, there's a clear delineation between reality and fantasy. Reality is a richly populated but dark world of old houses cluttered with memories. The fantasy world is one of gloriously animated and endlessly kinetic watercolours come to life. But as Conor comes to believe in and rely on his monster more, the boundaries between the two dissolve and merge. We come to realise just how far the story of the monster is intertwined into the story of the family with a heartbreaking final reveal. It's fair to say that a lot of the themes and the use of fantasy to cope with harsh reality are things we've seen in other films. Lewis McDougall's Conor reminded me a lot of Bastian Balthazar Bux in the 1980s children's classic - THE NEVERENDING STORY. Both boys are bullied at school and have to deal with destruction and absence through a magical story. And the film has an even more direct link to the Guillermo del Toro's PAN'S LABYRINTH - using many of the same animators. That said, A MONSTER CALLS is not as darkly gothic horror as PAN'S LABYRINTH - it's never truly scary in the way the latter film was. And the monster of the title, while powerful and sometimes angry, is never frightening. This partly reflects the kindly animation of his eyes, as well as Liam Neeson's voice work, reminiscent of his Aslan. In fact, the cast is superb in general, and kudos to the adult actors who are typically seen through Conor's eyes and so infrequently. We have to look through his prejudice to see their conflicted feelings, hurt, anger and guilt. Sigourney Weaver is particularly moving as Conor's starchy grandmother, played with a perfect English accent. But Toby Kebbell as his father, now living in LA with his new family, is also very good. Overall, A MONSTER CALLS is a beautiful balance of fantasy, grim reality, vivid imagination and nuanced depiction of grief. It deserves all the recognition and a wide audience and would serve as a tough but provocative watch for young adults in a similar situation to its protagonist. 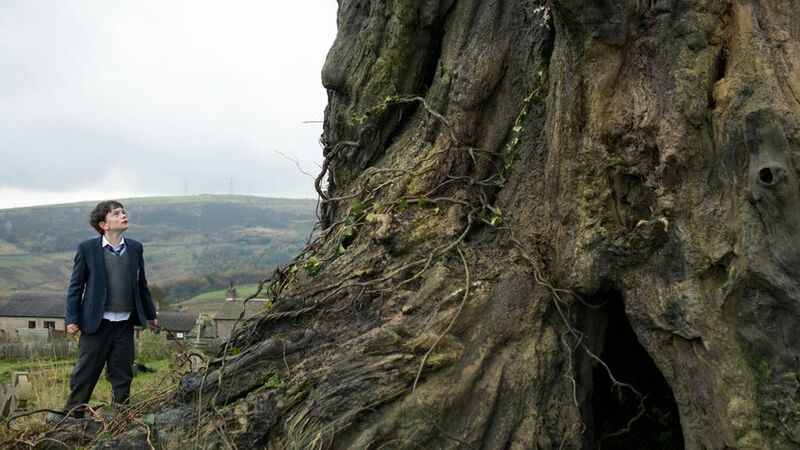 A MONSTER CALLS has a running time of 108 minutes and is rated R. The movie played Toronto and London 2016 and was released earlier this month in Spain. It opens on October 14th in Brazil, Israel, Cambodia and Turkey; on October 20th in Argentina, the Czech Republic, Croatia, Portugal, Singapore, Slovakia and Romania; on October 27th in Denmark, Hungary, Kazakhstan, Russia and Bulgaria; on November 3rd in Greece, the Netherlands, and Austria; on November 23rd in France and Estonia; on December 2nd in Poland; on December 23rd in the USA; on January 6th 2017 in the UK and Ireland and on January 12th in Germany.